We’ve all heard about the benefits of eating fish. The Japanese diet for example is especially rich in fish, and at the same time Japan holds the title of the world’s highest longest life expectancy (84 years). I’m sure their diet must be a contributing factor. When it comes to choosing between types of fish a little education can go a long way. I’ve been reading a lot about how wild and farmed fish are not comparable, and I’ve come to the conclusion that wild fish are the best choice. Keen to know more? Then here’s a summary of what you should know about farmed fish. So, based on what I’ve learnt I try to stick to two types of fish at home (of course I’m more relaxed for the occasional restaurant fish feast). 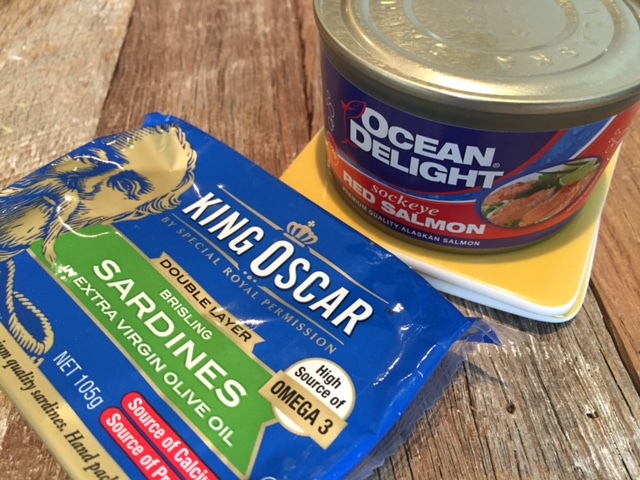 Surprisingly they’re both readily available year round, have a long shelf life, are relatively cheap and come in cans (or tins) – wild sardines and wild salmon. When it comes to canned salmon, the hero ingredient for this recipe, one type in particular is far superior to others – Alaskan sockeye red salmon (see photo above). Alaskan salmon isn’t allowed to be farmed (unlike for example Atlantic salmon), so when you pick up a can you know the fish is wild. Every 100g of Alaskan sockeye salmon is packed with Omega-3s, with 490mg of EPA and 660mg of DHA. I’ve read that the recommended weekly dose of fish for adults is two servings – or a combined daily total of 500mg of EPA and DHA. So consume just three of the small cans of salmon per week you’re hitting your recommended dosage without a trip to the fishmonger or the expense of fish oil tablets. 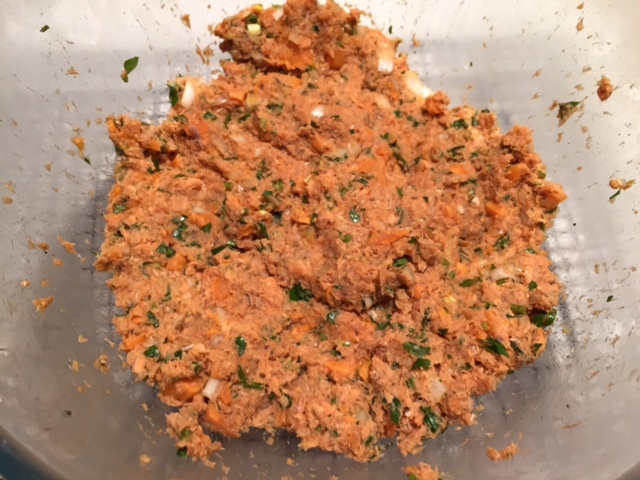 With that background over (hopefully you found it useful) I wanted to share a top paleo recipe for turning Alaskan sockeye red salmon into delicious fishcakes. 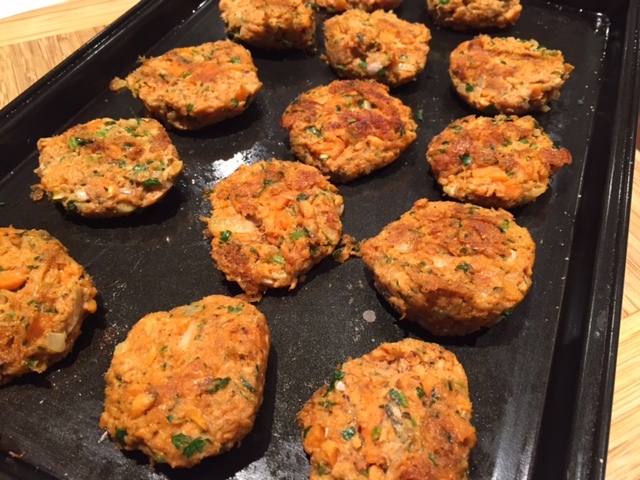 Wild salmon & sweet potato fishcakes. Packed with Omega-3s. Variations would include replacing the sweet potato with standard potato and experimenting with herbs and spices including ginger, dill and mustard. *if you are using a small can (212g) use half the quantities of the other ingredients. Peel, dice and cook the sweet potato (oven cook or steam cook) until the cubes are soft. Mash the potato until you have a smooth consistency. Drain the salmon and remove any bones – keep the skin because its packed with Omega 3s. Add the remaining ingredients to a large bowl. Once the potato has cooled add the potato and salmon to the mixture. Mix everything together really well. 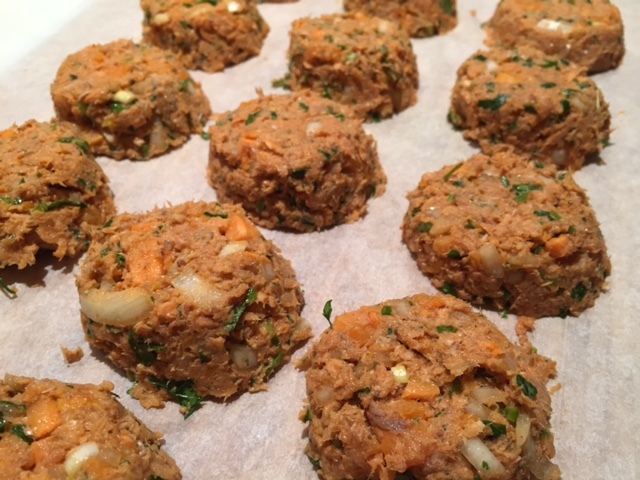 Then using a 1/4 measuring cup scoop out small fishcakes and transfer them to a tray lined with baking paper. 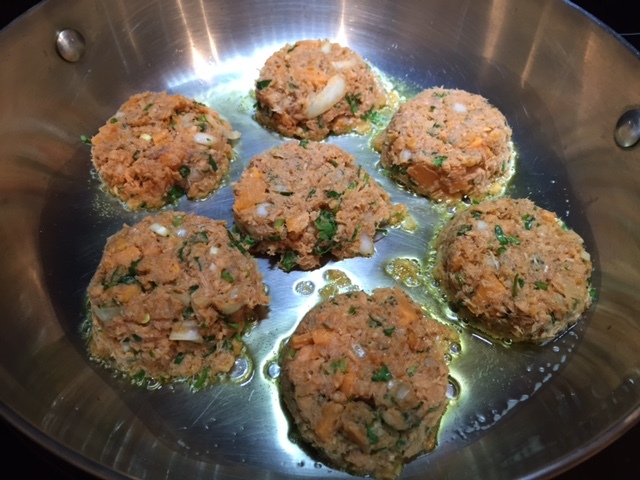 Transfer the fishcakes to set in the fridge for at least 30 minutes. Heat 1 tbsp olive oil, coconut oil or ghee in a large saucepan. Once the oil is hot add 6 or 7 of your fishcakes to the pan. Cook for around 3 minutes on each side. Add an extra 1 tbsp oil for every additional 6 to 7 fishcakes. Be careful not to let the fishcakes stick to the pan or you risk them falling apart. Once cooked keep warm in the oven or serve immediately. 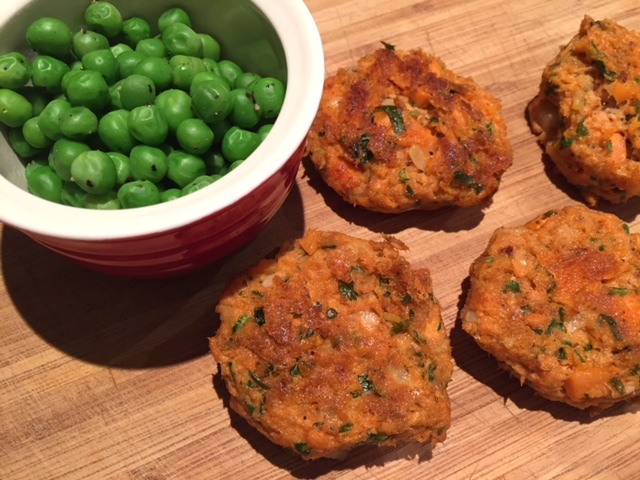 These fishcakes are a perfect light and healthy weeknight meal served with a fresh salad and peas or other green vegetables. 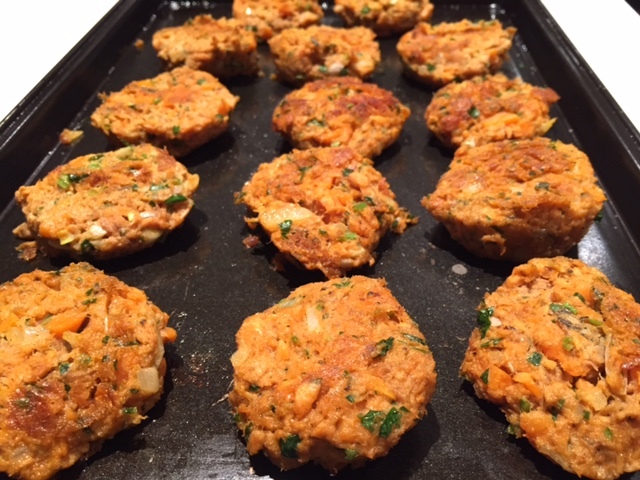 Tags: fishcakes, healthy, paleo, recipe, salmon, sweet potato. Bookmark the permalink. Neat recipe! I’ve also heard that fish is very beneficial for your health, but unfortunately fresh seafood here isn’t all that common. Sometimes dad will get some fresh fish from the farmer’s markets, because we know that has been whisked down to us straight from the coast. But these fishcakes look yum! A great way to add fish to your diet! Thanks so much and yes with these fish cakes all you need is a tin of salmon from the supermarket so no need to worry about fresh fish! I didn’t know that Alaskan sockeye couldn’t be farmed. Food for thought indeed. Adore fishcakes, will be trying this for sure. Love the flavours used in there…. Thanks so much – yes they are really easy too and would be perfect for leftover salmon. 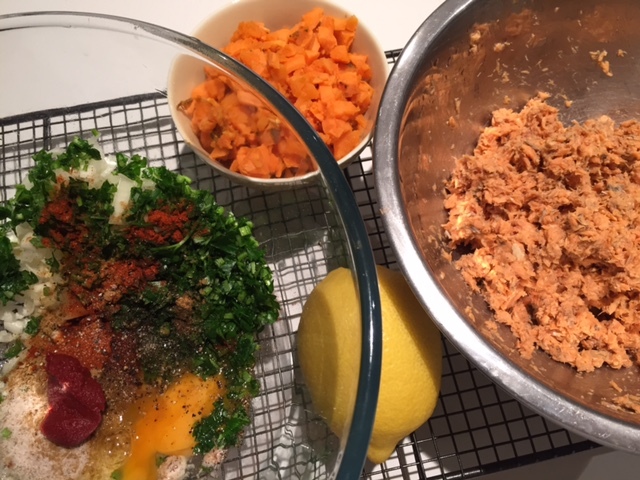 You can also experiment with the ratio of salmon to sweet potato…. All my favourite foods in one! Thanks Jenn for stopping by………. Thanks and yes it works really well without taking over the fish flavour…. Thanks – yes it’s really easy and they pair together well – such a healthy dinner too!